Welcome to the War Thunder encyclopedia – an online cross-platform military game for Windows, Mac, Linux, PS4, and Xbox One. The game is dedicated to the military aircraft, naval vessels and armored vehicles of WWII and Korean War/Cold War eras. Here you will not just learn about the game mechanics and the use of various kinds of vehicles in virtual battles, but you will also be able to read about the history of well-known historical machines of all kinds. There are 2,213 articles in this wiki at the moment. Enjoy reading! 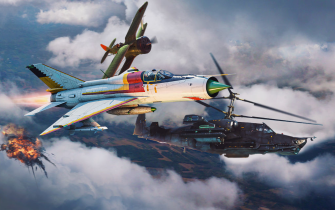 On 12 March 2019, Update 1.87 "Locked On" has hit War Thunder! Introducing Rank VII ground vehicles with the likes of M1A1 Abrams and the Leopard 2A5! This comes along with the growth of Rank VI aircraft, including the new fastest dart in the skies, the Mitsubishi T-2, and French helicopters. Fleet also earned new cruisers and destroyers for use! Perhaps the most exciting new mechanic introduced is the radar! Allowing the detection and tracking of aerial targets for elimnation! Pilots and Tankers have already shown their skills in War Thunder's festive adventures. 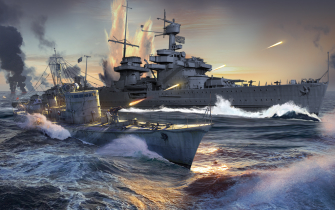 Now our brave sailors will go on a "Sea Voyage" in which pilots and ship commanders will be able to win premium vehicles and other prizes by completing the tasks in the combined naval battles. This event will last from 15:00 GMT on the 21st of February until 07:00 GMT on the 11th of March. How can you get premium vehicles? Warbonds! The February assortment of Warbond shop items are now available! 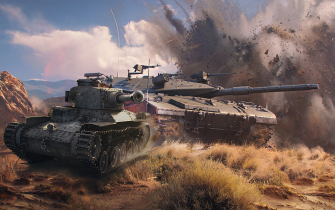 Fulfill Battle Tasks, earn warbonds, improve your shop level and unlock rewards! This assortment will be available until the 28th of February! The Italians now have their own ground forces tech tree! Supersonic jets are now in the game for Rank VI aircraft! Starting with the F-100D in the Americans, MiG-19PT for the Russians, and the Javelin for the British! Fleet — Witness the release and activation of the naval tree in the War Thunder Wiki! This page was last edited on 12 March 2019, at 23:53.